One Spokane, Wash., teacher who wanted to motivate his students to donate candy to the school's annual Trick-or-Treating event made an unusual bet to encourage participation. The wager? David Robinson, who goes by Robbie, would dye his hair and beard bright pink for breast cancer awareness if his East Valley High School students could donate at least 45 pounds of candy. Students in Robinson's class managed to collect 46 pounds, prompting the teacher to uphold his side of the bargain and "Go Pink," according to KHQ. 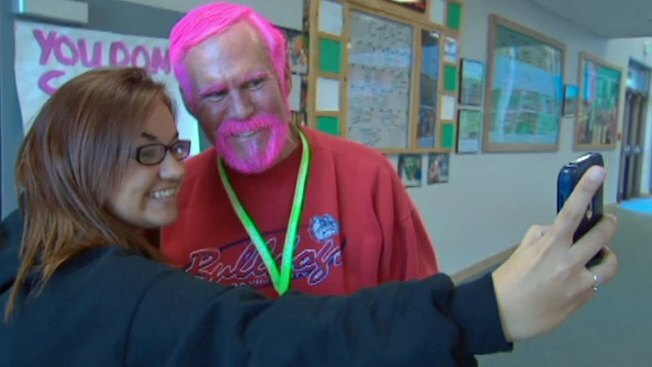 Robinson debuted his pink hair in school on Oct. 21 and plans to keep the neon 'do until the end of the week. For Robinson, whose mother died from cancer, the pink hair is more than just the byproduct of a lost bet. "I though to myself, holy cow, I've never done anything for that cause,” Robinson told KREM.